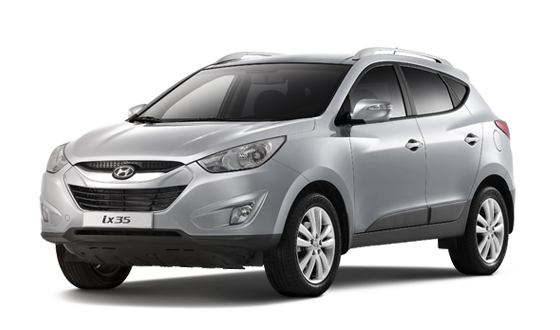 Hyundai Tucson / ix35 | SUV | HYUNDAI - NEW THINKING. NEW POSSIBILITIES. 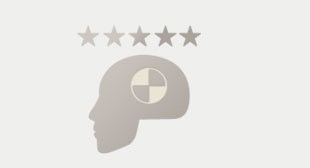 The Tucson received the maximum five-star safety rating by Euro NCAP, an independent vehicle safety organization, in its rigorous crash-test assessment program. The seat variation feature lets you use the space exactly as you wish. Innovative power & fuel economy with dynamic driving performance. ExteriorThe best package layout design of the urban SUV includes a high frontal area and sleek low back silhouette combined with spacious interior and cargo storage areas. INTERIORWhether you’re a driver or a passenger, you’ll feel right at home in the Tucson. Everything from the adjustable headrest to the heated seats and spirit-boosting sunroof will make sure of it. PERFORMANCEFinally, a gasoline engine and diesel engine that allows for high performance and high efficiency. It’s die-cast in aluminum and features variable valve timing and a variable induction system. The result is a quiet sort of power. 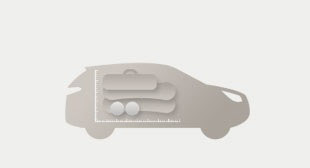 SAFETYDepowered airbags on the driver’s and front passenger’s seats deploy at reduced force to prevent possible injury. side airbags and curtain airbags are installed all around to protect occupants from injuries. CONVENIENCEYou want things just right. Then again, sometimes you need to change them around. no problem. the Tucson/ix35 lets you configure a multitude of seat arrangements. design approach to create a sculpture on wheels. Sporty and high-tech, and at one with the fluid, sculptural lines of the body. A distinctively large hexagonal radiator grille in chrome and high gloss black exudes an aggressive yet refined image. and fast make for a sophisticated silhouette. Built-in LED lights offer convenience and safety while enhancing the smooth, aerodynamic profile and cutting-edge styling. glass and an oversized bumper. Continue the fluidity that begins at the front, and connect the lines of the side and rear with effortless sporting character. 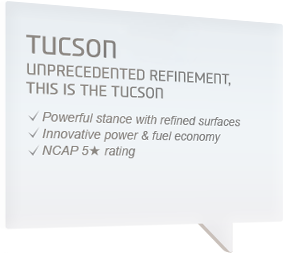 Tucson/ix35 promotional video "Glide the street" Showcases new Tucson/ix35's smooth features. Improves aerodynamics and safety, enhances visibility, and adds a touch of character. Incorporated into the bumper, where their aggressive detailing and design enhance the purposeful, bold frontal view. In 5mm thick glass, at high speed its aerodynamic design minimizes wind noise, while a pin prevents the wiper from lifting. Multi-spoke alloy wheels, in 17" or 18" diameter. Not just beautiful, but practical too, their excellent ventilation protecting brakes from overheating. fitted with silica tires for excellent grip and reduced fuel consumption. for you and you alone. choose and widen your options with Bluetooth. and full folding. The choice of seat positions offers exceptional flexibility. overhang and redesigned rear wheel suspension. With the handbrake located on the floor, there’s more room for an over-sized cup holder. The large storage area can accommodate a small 11 inch laptop. Deluxe map lamp and sunglasses case offer convenience storage in a perfect location. Performance with efficiency. What every car seeks. Well, the quest has ended, as the Tucson / ix35 combines both. Powering you along is a R2.0 regular diesel engine, or Theta II 2.4 or 2.0 MPi gasoline engine. Die-cast in aluminium, and featuring variable valve timing and a variable induction system. And so that nothing intrudes on the powerful, fluid motion delivered, vibration is minimised, there’s hardly any noise when idling and accelerating, and reduced overall weight enhances fuel economy. Dynamic and forceful, yet quiet and effective. Strength is truly beautiful when it wastes nothing. West Europe only.Australia exception.Engine performance might differ by regions.West Europe only. 6-speed auto transmission that looks & feels good Dynamic driving is possible in manual mode with the 6 speed automatic transmission. Miss shifting is reduced with the step gate shift pattern. Small leather shift knob improves outside look and feel. force between the front and rear wheels. 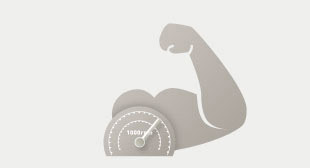 With MDPS, you also get sharp responses, accurate handling and fuel efficiency. trolling engine torque and distributing optimum brake force. Depowered airbags on the driver's and front passenger's seats deploy at reduced force to prevent possible injury. Side airbags and curtain airbags are installed to protect occupants from injuries. Move up and forward during a rear-end collision, using the weight of the back rest and the person's upper body, to minimize head and neck injuries. backward rolling on steep ascents. To keep control and maintain steady speed on steep, downhill descents, engage Downhill Brake Control. Foot parking brake is applied in auto transmission cars since it’s more convenient and saves space compared to the hand brake. LHD A/T only. Conveniently located to put control at your fingertips, the windows automatically stop if they sense an obstacle when closing, for added safety. look. Between them, a trip computer displaying information in text or icons, complete with sounds. separate temperature levels for driver and passenger. "Get out of the box" Seek freedom from boring everyday life with the new exciting Tucson. Lets you enjoy your favorite tunes by playing music files from mobile storage devices. iPhone is a trademark of Apple Inc.
Large 6.5 inch TFT-LCD screen of WVGA resolution. In-dash type DVD player and bluetooth that recognizes voices. 5.1 channel surround sound, digital outside amp that has better sound compared to analog amp. The navigation screen is connectable to the optional rearview camera. When changing lanes, touch the turning signal slightly and return it back to neutral within 0.5 seconds then turning signal lamp is lit three times. It’s convenient and improves safety. Keyless ignition for security and convenience. And more than a touch of style.